After the euphoria of a cup win at Manchester United, Derby came crashing back down to earth on Saturday with a reality check at Bolton Wanderers. Despite dominating possession for long periods, they could not break down a resilient Bolton side who had given themselves an early lead. This problem not uncommon to the Rams fans as similar scenarios were often presented back in the days of Steve McClaren. What Frank Lampard has got in his favour is options! David Nugent has had a run in the side, but both Jack Marriott and Martyn Waghorn should be more than capable of bringing something a little different to the Derby attack. Indeed Waghorn can play wide or in the middle and with Tom Lawrence having served his suspension there are alternative options for the wide positions too! Wednesday night sees Norwich City visit Pride Park and they often prove to be a stubborn opposition to break down. I’m sure this season will be no different. Despite dropping down to ninth in the table we sit just four points off the top, but just think where we would be had we not given up points to Blackburn and Bolton! Hindsight is a wonderful thing, and we need to put those games behind us and get on with the task in hand. One area where I feel we could improve is the final ball, the ball to unlock defences. We are a team that has the talent, but such is the nature and competitiveness of the division a couple of wins sees you looking towards the top of the table and on the reverse side of the coin, a couple of losses can see you plummet down the division. I think Frank Lampard may freshen things up against Norwich with a start for either Marriott or Waghorn and possibly a recall for Lawrence. The League Cup draw wasn’t fixed! Honestly! 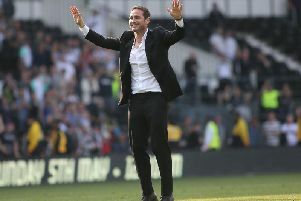 It was made live on the EFL highlights programme on Quest TV on Saturday night and after defeating his former boss Jose Mourinho, Lampard now faces a trip to former club Chelsea. The boss is a legend at Stamford Bridge and obviously still very highly regarded by the hierarchy there. They have allowed two of their most promising prospects mason Mount and Fikayo Tomori to play for us for the season. It’s Chelsea’s call as to whether they are allowed to play in the tie, and it doesn’t sound optimistic at present which I feel is a shame for the lads. It won’t be long before they are wearing the blue of their parent club.